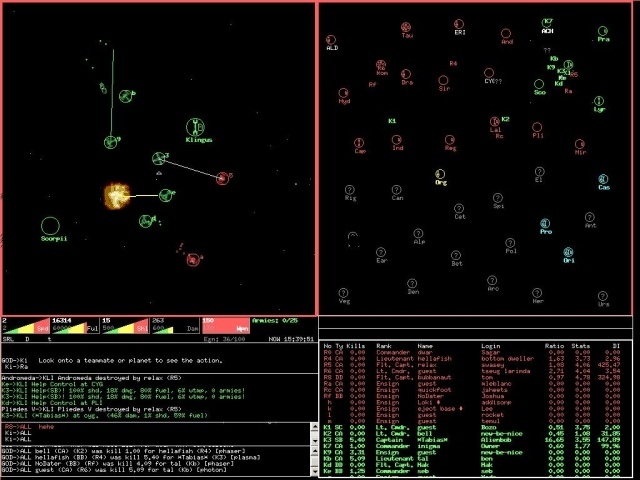 Netrek Classic is a free online war game. Battle up to 16 players per game. Use different ships and different weapons to battle against people around the world. The ultimate goal is to wipe out the enemy race fighting through the enemy front line. You and your team battle, bomb and take planets to overtake the enemy. Up to 16 people per game battle against each other over the internet on a virtual battlefield. Netrek is a free online war game. Battle up to 16 people per game. Since you are always teaming up with and playing against different people the game is extremely intense. There are multiple servers ready for you to play on and they are online 24x7. This game is war at its best. The only way to feel the intensity is to download it, completely free, no advertisements, full version....free. Netrek is a free multiplayer online space battle game. Qweas is providing links to Netrek Classic 4.4.0.4 as a courtesy, and makes no representations regarding Netrek Classic or any other applications or any information related thereto. Any questions, complaints or claims regarding this application Netrek Classic 4.4.0.4 must be directed to the appropriate software vendor. You may click the publisher link of Netrek Classic on the top of this page to get more details about the vendor.